In the spirit of “Hot August Nights” in Reno where everyone tricks out their rides and shows em off…. 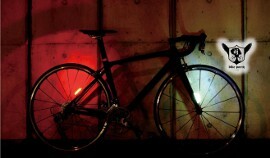 SJ Bike Party Presents HOT AUGUST LIGHTS! Get Lit?!? Hell yea! But your bike, not you! Special Announcement! 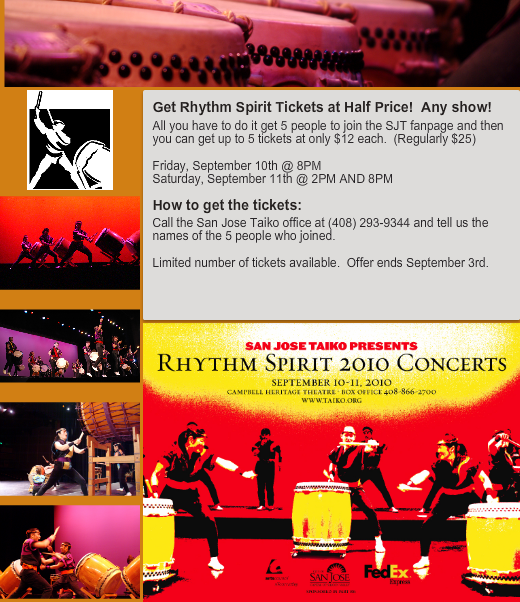 5 food vendors this month, a Theme Contest & SJ’s own world renowned musical group San Jose Taiko to play for SJBP! See below! “Wheels on the Street” @ 8pm sharp! Trick out your bike as weirdly as you can and compete for prizes! Contest details will be provided in the next week. Even if you don’t want to go all out – at least get a bright headlight and taillight! There have been many near misses due to riders weaving and cutting inbetween riders. 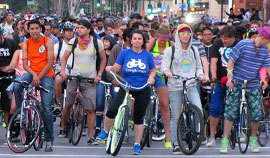 Not only does this not follow Bike Party “How We Ride” rules it’s dangerous to everyone around you. Have a good time cheering/booing others that follow/don’t follow the SJBP “How We Ride” mantra. JUST CONFIRMED: SAN JOSE TAIKO WILL BE PERFORMING BEFORE THE RIDE! BE THERE BEFORE 7:30PM! Route: Before you join us Please read the How we ride section of the site.